I know this gumbo recipe is nowhere near being authentic, but it’s time for Mardi Gras again, and I am desperately craving for a steaming bowl of gumbo and rice. Now you all might be wondering why I have such great love for Southern cuisine, considering the fact that I’m not a daughter of the Bayou. Well, my friends, once you get to witness the Mardi Gras Carnival and taste the delicious gumbo at the carnival, your heart instantly belongs to the swamps of Louisiana. Gumbo is a type of Cajun Creole stew or soup that originated in the state of Louisiana, and is one of the state’s most signature dishes. The name of the dish derives from the African word ‘ki ngombo’, which means ‘okra’, suggesting that okra was originally one of its main ingredients. In the Native American Choctaw language, the word ‘kombo’, pronounced similarly to the name of the dish, translates to ‘filé’. Interesting enough, filé powder was one of the ingredients to make gumbo. In other words, despite all the linguistic confusion, the dish could have been named after its ingredients. Now, as we all know, Louisiana cooking is strongly influenced by French cuisine, and gumbo is among them. Many gumbo recipes call for a ‘roux’ which is a mixture of fat and flour acting as a thickening agent in sauces. So, long story short: Gumbo is the result of many different cultures, from Native American, African, and French, coming together. That being said, the actual origin of gumbo still sparks debate among gastronomers. However, origin aside, we can all agree that gumbo is among one of the most delicious and popular foods in the Deep South. Now you might be wondering what makes gumbo so special, then you’ll need to learn the basic ingredients to a pot of gumbo. What Are The Ingredients In Gumbo? The ‘Holy Trinity’ of vegetables: If the French have their ‘mirepoix’ (a veggie combo of carrot, onion, and celery), then the Louisianans have the ‘Holy Trinity’. Consisting of onion, celery, and green bell pepper. These vegetables will give your gumbo a hint of sweetness and lots of powerful flavors. You can add jalapeño pepper instead of bell pepper for extra heat as well. Thickener: as mentioned, there are 3 main thickeners that you can choose to put in your gumbo: roux, filé powder, or okra. We’ll go into details about them later. Poultry: chicken, duck, turkey, quail, pigeon, pheasant. Seafood: crab, shrimp, oyster, mussel, scallop. Sausages: any type of sausages will work just fine, but smoked sausages are the ones that give gumbo a wow factor. If you don’t like sausages, bacon or any type of cold cuts would be a good alternative. Lots of spices and herbs: dried thyme, dried oregano, garlic powder, onion powder, filé powder, cayenne pepper, smoked paprika. And rice: gumbo can be served over a bed of rice, or cooked rice is mixed into the gumbo to make the dish more wholesome. However, there have been arguments about whether rice should even be served with gumbo. If you’re getting confused and don’t know how to match the ingredients, here are some popular gumbo combinations: chicken and sausage okra gumbo, seafood gumbo, duck and sausage gumbo, etc. 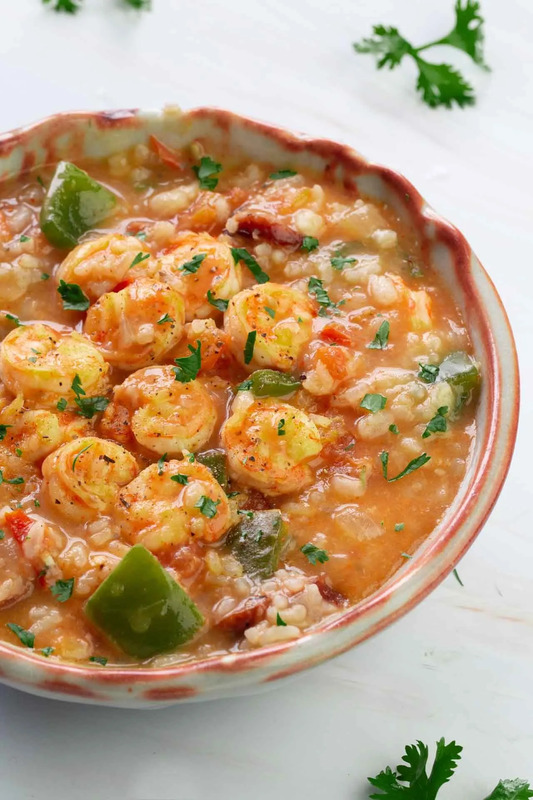 Gumbo is a versatile dish that you make however you want, with whatever ingredients you have. That being said, there is one thing you have to make up your mind about: the thickener. What Can You Use To Thicken Gumbo? Some say it’s the thickener that breathes soul into the gumbo, and I believe they couldn’t be more right. As I mentioned the most commonly used thickeners for gumbo are roux, okra, and filé powder. Let’s get to know them. Roux is a French cooking technique where you cook flour in a kind of fat: such as oil, butter, or lard to form a paste. Dissolve that paste in liquid and you’ll get a thick sauce. There are 3 types of roux: white, blond, and brown roux. All roux start out as white roux, then depending on what you’re cooking, you’ll have to cook it longer to achieve your desired roux color. To make gumbo, you’ll need a brown roux as its flavor is more intense in comparison to the white or blond one. Dark brown roux also gives body to the gumbo, along with a rich and hearty mouthfeel. Okra is another thickening agent that gives gumbo its signature flavour. Okra is a type of flowering plant that produces edible seed pods. The plant can be found in West African and in South Asian regions. Now, some people may not enjoy okra very much, as it can be slimy. Whether you like it or not, this sliminess is what thickens the gumbo. Unlike the rich roux, okra won’t thicken your gumbo as much, but it will brighten up your soup with a refreshing taste. To many people, filé powder is the only acceptable thickener of a gumbo. This spicy powder is finely ground from the dried leaves of sassafras, a type of North American tree that is distinctively known for its aromatic properties. As a thickening agent, filé powder can be substituted for okra when okra’s out of season. Adding this herb powder to the gumbo will not only give the soup texture, but also a unique flavor with a hint of earthiness. You can use any of the techniques to make a thick gumbo. Some people even combine the techniques by making a roux and, at the same time, putting okra to the gumbo. There is no real recipe, so just do whatever pleases you. Now, there are some unconventional ways to thicken your gumbo, like using a slurry – a mixture of water and cornstarch. Personally, for today’s recipe, I won’t be using any of those aforementioned techniques. Instead, I will be adding cooked rice to my gumbo, and the starch from the rice will thicken the soup slightly. An average gumbo recipe takes hours to cook. Who wants to wait that long when you’re desperately craving a hearty bowl of spicy gumbo? Well, my dear friends, the wait is over as we take on this quick and simple version. Heat up vegetable oil in a large pot. Then add chopped onion and sautée for about 2 minutes over medium heat or until tender. Add sausages and cook for about 2 minutes or until lightly browned. Stir in green bell pepper and cook for 2 minutes or until tender. Now add garlic and stir until fragrant. Add diced tomatoes along with its juices, chicken broth, bay leaf, all of the dry seasonings, and hot chili sauce. Bring to a boil, stirring occasionally. Cook for about 2 minutes, then stir in cooked rice. Add shrimp and cook for another 3-4 minutes or until all the shrimps turn pink. Taste and check for seasoning; then discard the bay leaf. Remove the pot from the heat. Serve warm; garnish with a pinch of cayenne for extra heat, freshly cracked black pepper, and chopped parsley.